My 3 year old is able to identify several French landmarks: the Eiffel Tower, the Arc de Triomph, the Notre Dame Cathedral, Sacre Coeur and knows that the river crossing Paris is called Seine. I should mention that we are not French and have never taken our kids to France. It all started as a game while playing with some souvenirs my husband had gotten from Paris: miniatures of the Eiffel Tower and Arc de Triomph. As I’d been to Paris myself, I told my son stories about the city and its landmarks and focused on things I knew would raise his interest: the four elevators of the Eiffel Tower, the bridges over the Seine…The library was a great resource and I could check out several children’s books about one of my favorite places in the whole world: Paris. Any book that had at least one photo or drawing about France was immediately added to my pile of books. I want my boys to be aware that the world is bigger than our backyard and some day, when we feel comfortable traveling long distances with these two energetic kids, we’ll introduce them to other countries, their people and traditions. Until them I want them to get familiar with new places on the map. Because my husband and I both grew up in Europe, we obviously started with the European countries. France was just the first. The only thing is that, although we visited several other European countries, we don’t have any other landmark souvenirs. Sure I can print out some photos but playing with small landmarks makes it more personal and imagine when you go visit those countries and your kids will see the real buildings right in front of them. Those moments will be precious! Magnetic Toy Machi Paris by Kiko Toys. Take the metro from the Eiffel Tower to the Arc de Triomph and back. Draw the streets yourself on the chalkboard, then wipe them out and reinvent the city as many times as you want. Everything is possible with this set of magnetic wooden blocks. It makes a great travel toy. Magnetic Toy Machi London by Kiko Toys. Once you’re done visiting Paris (though you can never get enough of Paris! ), you should take the Eurostar to London. Ride on a double decker bus or take a black cab and explore one of the most interesting museums: The British Museum. Next stop: the London Eye and go across the street and take a picture in front of the Big Ben. It’s a must! 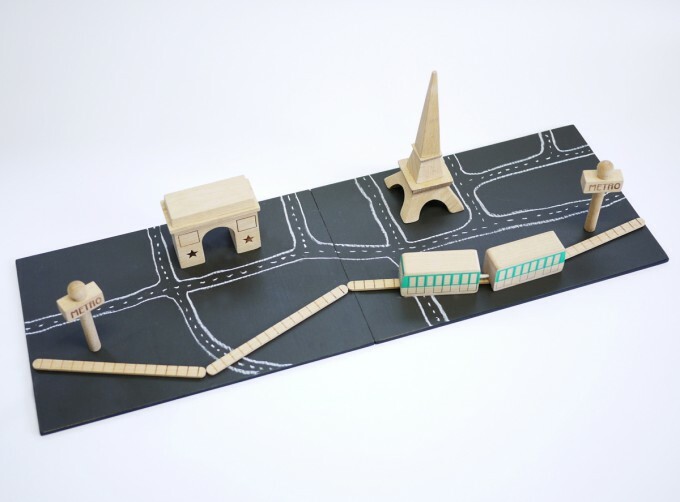 There is so much to see in London…Kids will love this set which includes 14 painted wooden blocks. It will help them develop their imagination and guarantees many hours of beautiful fun play. London City in a Bag. What fun is it to have a bridge but no water underneath? This wooden set gives you not only the London Bridge but also the Thames and a boat to travel from one attraction to another. If you prefer the train , here is a fun ride for you. You’ll admire 13 London landmarks: new and old. This set has over 70 pieces and is compatible with most other popular wooden train sets. Here is a project for both kids and parents or grandparents: putting together the Roman Coliseum: 110 large wooden blocks. It makes a good starting point for talking about the Roman Empire, this is if you like history. If your child is too little for the Coliseum wooden set, you may go for another Italian landmark: the Leaning Tower of Pisa – an intriguing building. This toy is for kids age 3 and up. 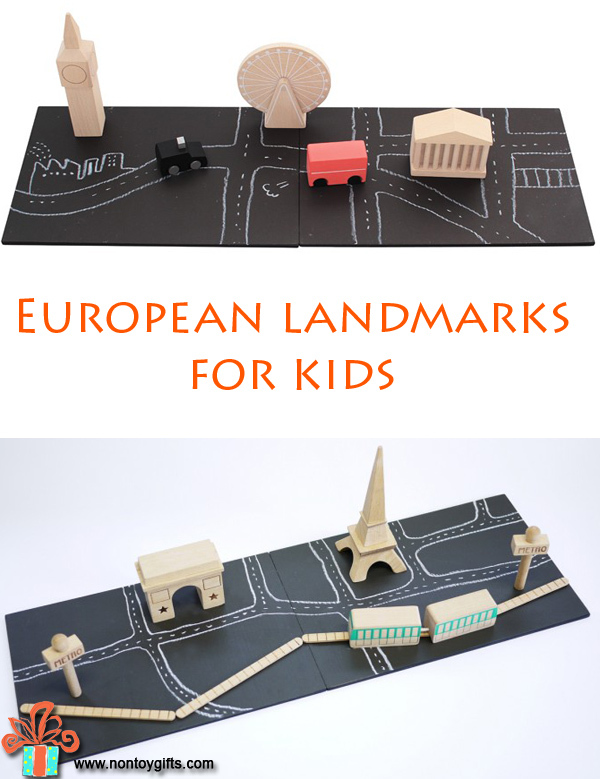 This wooden set may contain only 2 European landmarks, but it looks so nice that I had to include it on my list. What a fun list of toys! My daughter is Paris fascinated after reading Madeline and they’d make a perfect gift. I just found your post on the Mom Blogs Party. I love this idea. Thanks for posting. I will put it on my Christmas list for the kiddos. Thanks for stopping by Julia! I know, these are so adorable. I’ll certainly get a London toy set myself once I start teaching my son about England.